This Von Duprin 051701 12" EXT ROD is an extension rod for surface vertical rod exit devices to accommodate doors up to 8 feet in height. Von Duprin 4954-8' removable steel mullion. Mullions provide single door performance in double door openings with rim devices. For use with all Von Duprin Panic rim devices. Von Duprin 373L- 03,Lever trim for 88 Rim, 8827/8875 exit devices. Key locks/unlocks lever. Key cylinder with lock /unlock labels provide a clear direction of rotation to secure opening from inside. This Von Duprin CX9875EOF-3'-US26D is a Chexit Delayed Egress Exit Device fire rated mortise lock device for all types of single doors up to 4' x 10' and double doors up to 8' x 10'. This product is generally non-handed unless it is used with one of the following options: -2 (Double Cylinder) or SS (Signal Switch). Von Duprin - 880TP-US4 Special Order Thumbpiece Cylinder Trim for 88 series Rim Exit Devices. XP Extra performance. For increased security the XP98/99 rim exit device has a static load force resistance of more than 2,000 pounds, twice that of standard rim exit devices. The two-piece latch bolt forms a 90° latch-to-strike contact. The "smart" latch changes shape when subjected to external forces. This design enables the exit door to withstand an external attack and remain secure. Von Duprin 99L exit device with 996L lever trim with black painted finish. 98/99 exit devices with modern touchbar styling for heavy traffic applications. Device with lever trim function-key locks and unlocks lever. This is a package of 10 replacement 55 Series dogging screws for exit devices manufactured after 1970. Von Duprin - 990TP-BE-26D Special Order Passage Function Thumbpiece Trim for 98/99 series Exit Devices. The Von duprin CX99L is designed for use on delayed exit applications, the Chexit system is ideal for controlled areas. The Chexit system will keep an exit door secured for a 15 second period, yet tied into the fire alarm system will release immediately when an alarm condition exists. Von Duprin 98L-NL exit device with 996L-NL lever trim. 98/99 exit devices with modern touchbar styling for heavy traffic applications. Device with lever trim function-key locks and unlocks lever. The Von duprin EL3347A-NL-OP Concealed Vertical Rod Device for all types of single and double doors. Fits fits aluminum door stiles as narrow as 2-1/8". Von Duprin 33A-NL-OP, narrow stile exit device with night latch trim for door stiles as narrow as 1-3/4". For all types of single and double doors. Key retracts latch, re-locks when key is removed. Optional Pull Required. Polished chrome finish. Von Duprin - 880TP-26D Special Order Thumbpiece Cylinder Trim for 88 series Rim Exit Devices. Electric strikes provide remote release of a locked door. They allow the door to be opened without retracting the latchbolt. Von Duprin is the leading manufacturer of premium, heavy-duty electric strikes known for their reliability. The Von Duprin 6223DS with Dual monitor switch closed back electric strike for use with mortise locks without deadbolt or cylindrical locks on 1-3/4" thick double door. This is a replacement slide-in cover that fits Von Duprin 22 & 2227 Series 3-Foot non-fire rated exit devices. It is available in either an aluminum or dark bronze finish. This item is shown as shaded in the diagram above. Von Duprin 98NL, rim exit device with 990NL night latch trim. Night Latch function- key retracts latchbolt. Von Duprin 9975K-F. UL Fire rated Mortise lock exit device for all types of single or double doors. Fits door stiles as narrow as 4-3/4". Von Duprin CD98L-exit device with 996L lever trim and cylinder dogging. 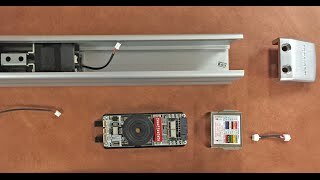 98/99 exit devices with modern touchbar styling for heavy traffic applications. Device with lever trim function-key locks and unlocks lever. Open Back Mortise Device Double Door Strike for-2-1/4" thick door. Von Duprin 99EO, exit only rim exit device. Series 98/99 exit devices with modern touchbar styling for heavy traffic applications. Device ships Exit Only/Dummy Trim/Night Latch ready. Field selectable. Exit only, no outside operation. Trim available separately . The Von duprin QEL98NL-OP is a rim exit device with night latch function and QEL Quite Latch Retraction. Von Duprin CD99L-DT exit device with 996L Dummy lever trim and cylinder dogging. 98/99 exit devices with modern touchbar styling for heavy traffic applications. Device with dummy lever trim function. Electric strikes provide remote release of a locked door. They allow the door to be opened without retracting the latchbolt. Von Duprin is the leading manufacturer of premium, heavy-duty electric strikes known for their reliability. 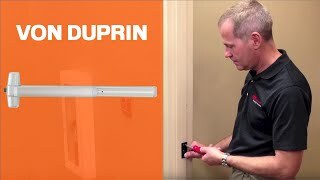 The Von Duprin 6211 electric strike is for use on new installations with mortise locks without deadbolt or cylindrical locks on single door, hollow metal frame applications. Von Duprin 996L-BE blank escutcheon breakaway lever trim for 98/99 series exit devices. Lever always operable , no cylinder. The new 996L Breakaway trim has become the standard lever trim offering on the 98L/99L series devices. The Breakaway design is especially effective in areas where vandalism to door hardware is a problem. 7/32" dogging key for Von duprin exit devices. Von Duprin 360L-17 Lever trim for 33A series exit devices. Lever trim, key locks and unlocks lever. Von Duprin SS99NL-F, UL listed Fire Exit Hardware. Night latch function, key retracts latch. Von Duprin - EL-9975L-US28 Special Order Mortise Lock Exit Device with Locking lever and Latch Retraction. Von Duprin EL9975L. Mortise lock exit device with electric latch retraction and locking exterior lever 996L-M. For all types of single or double doors. Device with lever trim function-key locks and unlocks lever. Fits door stiles as narrow as 4-3/4". The Von duprin EL3547A-NL-OP Concealed Vertical Rod Device for all types of single and double doors. Fits fits aluminum door stiles as narrow as 1 -3/4". Von Duprin - 99TP-2-US28 Special Order Double Cylinder Rim Exit Device with Thumbpiece Trim. Von Duprin 99TP-2, double cylinder exit device with 990TP thumbpiece trim. 98/99 exit devices with modern touchbar styling for heavy traffic applications. Device with thumbpiece function trim - key locks and unlocks thumbpiece. The Von Duprin 5575L is a narrow stile mortise lock device for all types of single and double doors. With keyed lever. Electric strikes provide remote release of a locked door. They allow the door to be opened without retracting the latchbolt. Von Duprin is the leading manufacturer of premium, heavy-duty electric strikes known for their reliability. The Von Duprin 6211WF electric strike is for use on new installations of mortise locks without a deadbolt or cylindrical locks on single door, wood frame applications. The Von Duprin 88NL traditional crossbar exit device with night latch design with proven service on rugged applications. The Von duprin EL3347A-EO Concealed Vertical Rod Device with electric latch retraction conditions for all types of single and double doors. Fits fits aluminum door stiles as narrow as 1 -3/4". Replacement active end cover for Von Duprin #22 & 22F rim exit device. Von Duprin 2227EO-LBR, Exit only surface mounted vertical rod exit device less bottom rod. Device ships Exit Only The 22 series exit devices are an economical alternative, incorporating a modern touchbar styling for all types of doors. Exit only, no outside operation. Von Duprin 9827L surface mounted vertical rod device with lever trim. Series 98/99 exit devices with modern touchbar styling for heavy traffic applications. Device with lever trim function, key locks and unlocks lever. The Von DuprinE9975L electric mortise lock device has all the versatility and advantages of the standard mortise lock device, plus the advantage of being electrically controlled by a remote switching device, an access control system or an automatic fire alarm system.